The Kennel Club has certain rules for anyone wishing to judge dogs at their registered clubs in the UK. It is down to the breed club who nominate them and each individual judge to ensure that they are up to date with their training and are aware of all rules and regulations for being a dog show judge. For a person to be able to judge dogs in the United Kingdom they must have their name on a breed club judging list. These lists have two sections; one for the breed specialist who is only knowledgeable in the one breed. The other is the ‘all rounder’ which is a term used for people who are interested in and have knowledge of other pedigree dog breeds. 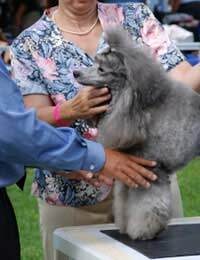 Within the lists there are further sections depending on how many dog show classes the judge has presided over and how far up the judging ladder he has progressed. Once a judge has reached the top of the judging tree he is able to judge his own breed at championship shows and award challenge certificates which ultimately enables the winning dogs to be called champions. All through his judging career the judge will have to abide by Kennel Club rules, follow guidelines and attend training seminars. Any judge who performs unsatisfactorily can be removed from the judge’s lists and stopped from judging at dog shows. The objective of the Kennel Club is to promote and encourage the general improvement of dogs. Judges are expected to comply with these objectives. Winning dogs will influence the future of each breed as they are likely to be bred from and used at stud, the judge must always place a fit and healthy dog in the show ring and not reward unhealthy dogs. There has been questioning of judges only placing fit and healthy dogs as a judge is not a vet and cannot always see what is happening underneath an apparently healthy looking coat. He can only judge the dog on the day, assess movement and use his hands and eyes when checking the conformation of the dog. A bad temperament in a dog may not show up in the show ring if the dog is handled correctly or sadly, in a few cases, lightly sedated. As a rule the judge has no idea of the dogs entered under him. A judge can only see a number on the exhibitor and has to match this number to the dog from a catalogue once he has judged all the classes given to him that day. The judge may be aware of hearsay and gossip concerning a particular dog but as the dog is anonymous to him whilst judging he must use his own judgement whilst assessing each class. The onus for placing an unhealthy dog is placed fully on the shoulders of the judge and is causing some concern with those interested in judging dogs. The code of best practise also shows how a judge must present themselves whilst in the ring even down to what to wear and what not to eat and drink whilst judging. They should be courteous, handle the dogs professionally and with integrity and not converse in a familiar way with the exhibitors. The Kennel Club keeps their code of best practise updated to include any new guidelines when judging dogs and also rules regarding the qualifications of judging at all levels of dog shows. Copies of the full code of best practice can be obtained from the Kennel Club or downloaded from their website. Can Anyone Be a Dog Show Judge? What Training Do Dog Show Judges Have?